Multiple sclerosis (MS) is a disease in which your immune system attacks the protective sheath that covers your nerves. This condition results in disrupted communication between the brain and the rest of the body. MS can cause the nerves themselves to deteriorate, which is currently irreversible. The symptoms of MS are often variable and unpredictable based on the severity of the condition. Common symptoms of MS include fatigue, numbness/tingling in the face, body, or extremities, weakness, abnormal gait, and impaired vision. MS can also cause cognitive issues, emotional changes, and depression. Even if a claimant’s condition does not meet this threshold, they can still be found disabled based on the physical and mental limitations caused by their disease. For instance, a person who suffers from significant weakness in their dominant upper extremity may be unable to perform any heavy lifting, repetitive grasping, or subtle manipulation. A person suffering from gait instability may be unable to perform prolonged walking or standing. Depending on the severity of a person’s limitations, they may be unable to meet the requirements for any competitive work activity. 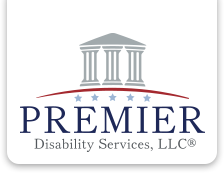 Premier Disability Services, LLC has extensive experience assisting disabled workers who have multiple sclerosis. If you have multiple sclerosis and you are unable to work, please contact our office for a free evaluation of your claim.